It’s Friday night…are you eating take-out? Glad that the weekend is finally upon us that you can’t muster up the energy to cook anything? Wellll friends, Marc has taken this opportunity to whip up a culinary delight. 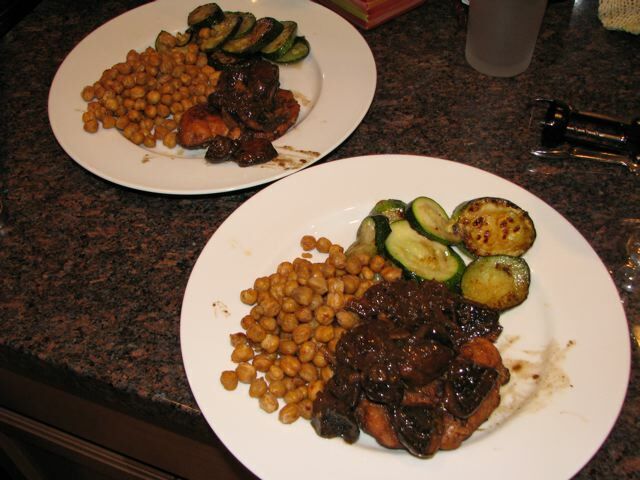 Marinated and braised chicken, with mushrooms and onions, and zucchini and roasted chickpeas on the side. I’m a lucky ducky. And full…and a little tipsy. 1. Tomorrow is the Big Sister Picnic. I am very nervous as I am one of the planners (dare I say the primary planner?) of this event. I hope it goes off without a hitch–I hope people enjoy themselves, and hang out on Spectacle Island (one of the Boston Harbor Islands) and play, and engage with one another. I hope, I hope, I hope! And I hope it doesn’t pour, like it currently is. 2. My friend Phil is coming to stay with us for a couple of weeks in September. As it gets closer, I am getting more and more excited. I definitely miss things about college and about my Midwestern roots, and I think having Phil around (even though he’s going to be rehearsing a show!) will be great fun. I really do enjoy when Midwesterners head east and visit me. I think Phil falls in that category, even though he currently lives in New Jersey. 3. Apparently, I bought my friend Carrie’s daughter the most AWESOME book…and she can’t get enough of it. Carrie has read it (according to her…) 80 million times, and is not loving that, but it makes me happy. Maybe I have missed my calling and should have been a children’s librarian! 4. George W. Bush, our fearless leader, was talking talking talking to Vladimir Putin during the opening ceremonies for the Olympics. Shut your yap and watch the show. Moron. That would be chicken seared with olive oil and garlic, de-glazed with some lemon juice and a half bottle of pinot grigio, braising for a while before mixing in the baby bella and caramelized red onion mixture, before being finished with some butter. Just sayin. If only I always had the time and motivation to make you so happy and drunk! 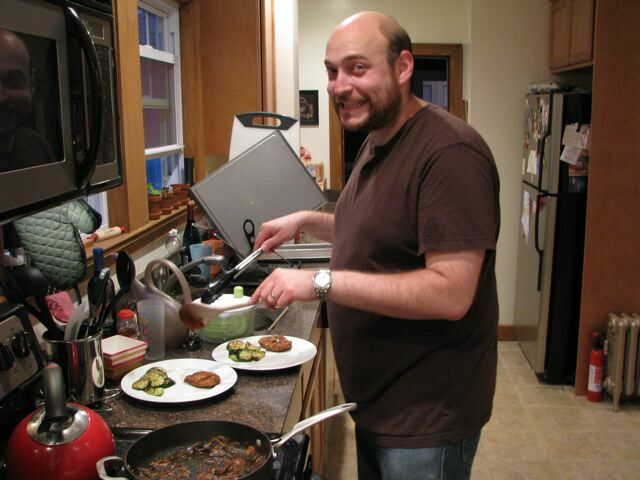 I have a feeling before long Marc will have his own cooking show, filmed right in your kitchen, on PBS or the Food Channel! Does he have a key phrase like “Yummo” or “EVOO”?